For a few of our clients, the journey from the briefing of a project to the full, finished product can take some time. This is particularly true when collaborating in the financial services industry where there are stringent regulatory constraints around promotions and marketing. 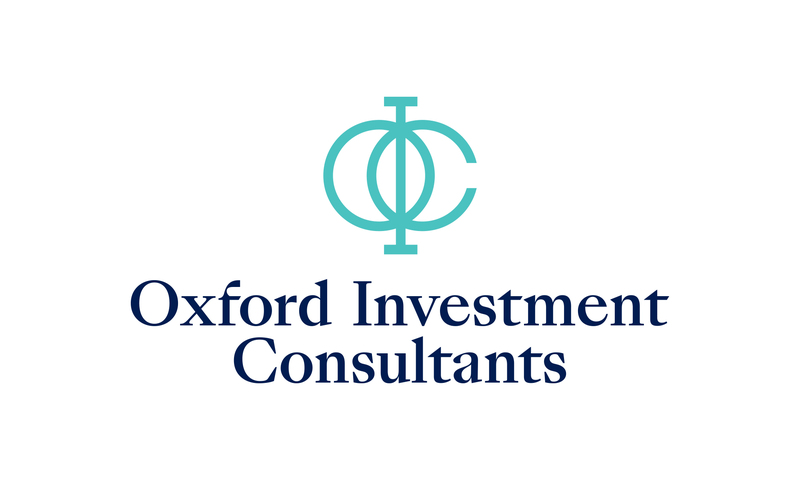 One such client is Oxford Investment Consultants. We designed their branding over a year ago and launched a small website at the time. The bulk of the work we had done however remained under wraps. However – the wait is over. Following their full FCA authorisation, this past week has seen the launch of the complete site we had planned from the outset. It’s a project that I’m really proud of and a great piece of new design for financial services. It’s a strong case study of the work we’ve been doing in that industry over the last couple of years. 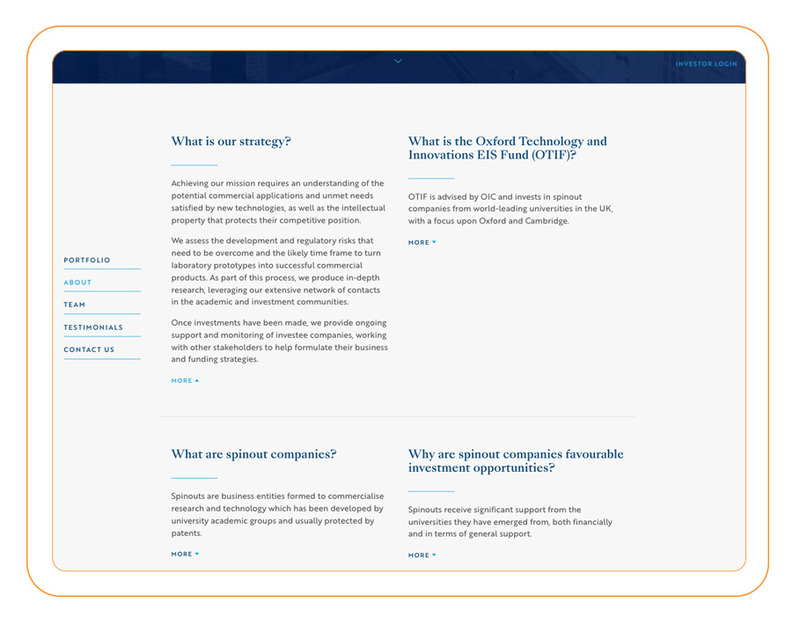 Amid a fairly formal colour livery of contrasting blues, Oxford Investment Consultants would seem to have a very formal piece of corporate branding. However the reality is a brand scheme with a great deal more to it. For starters, the identity design itself is one which we were particularly proud of. A striking symbol, it feels strong and original, a really smart and instantly recognisable piece of branding. Online, what at first glance seems to be a very straightforward aerial photograph is anything but. Rather, it’s a slow drone video of the dreaming spires of that fabled city. Our customisation is a grading of the film with OIC’s brand colours. In of itself using video on a website is hardly radical. However it’s still pretty unusual in the financial services industry where often very similar visual tropes abound. I’m thrilled with the sense of depth and movement it gives that immediately sets this project apart from it’s competitors. 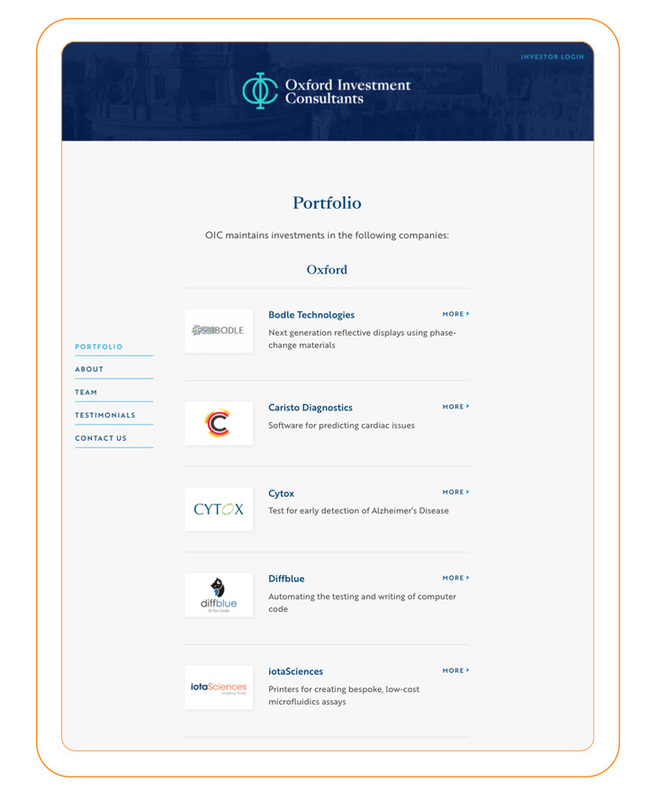 The biggest area in which the website has changed with its full launch is the new investment portfolio section. This addition has expanded the site pagination by 60%. We’ve added in every one of their investments, giving each its own page. These feature branding, background to the company and imagery to enrich and explain their work. 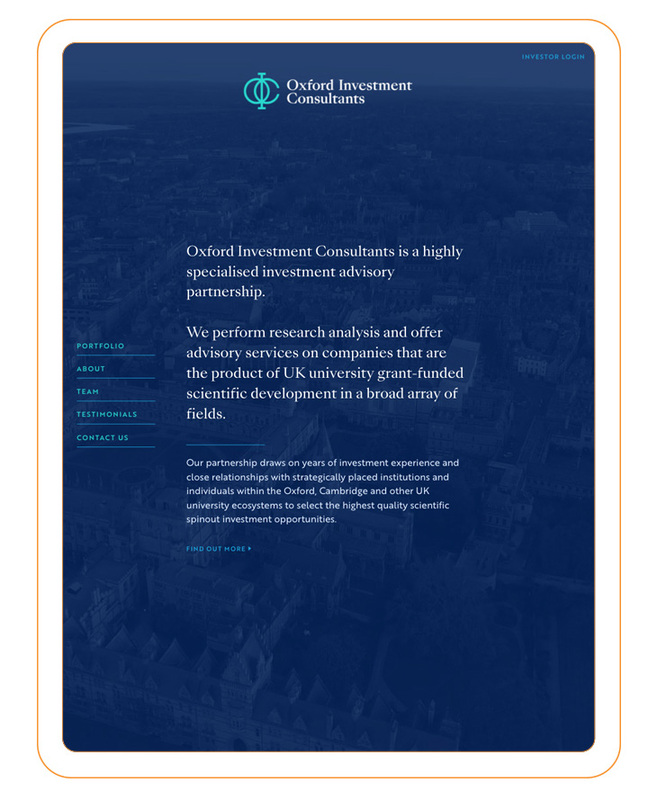 The other key feature of the finished site is the Investor Login area which can be accessed from every page of the site. This feature adds a huge level of sophistication to our technical build. Every added file within the Investors section is contained within a secure area separate from the everyday working website files anyone can see. Carefully tested, this Investors area allows for multiple users to be assigned a page, each with their own downloads neatly presented. 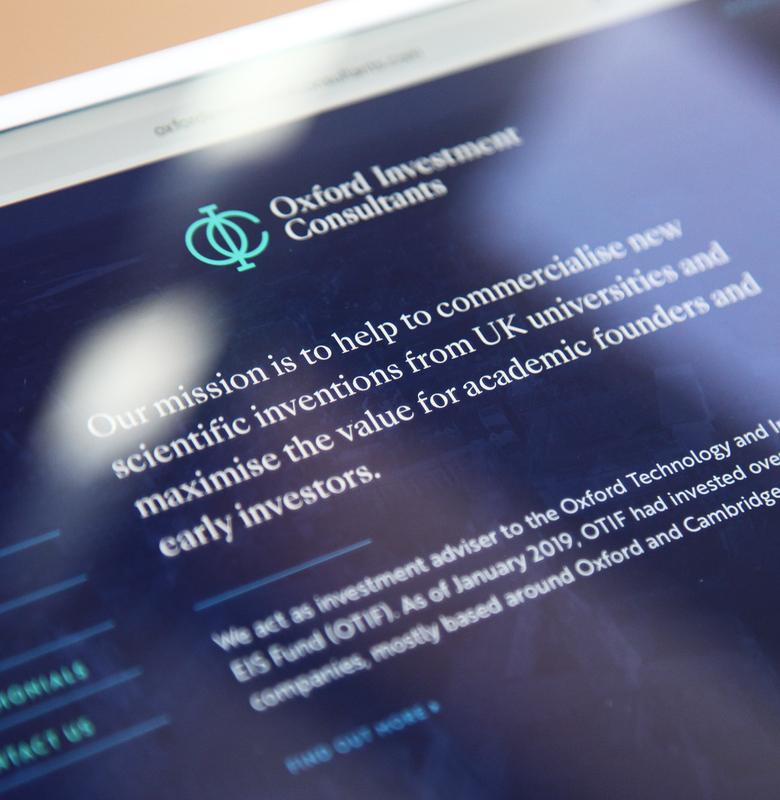 In an era when everyone needs access to their documentation at a moment’s notice, having this offering is not only hugely useful, it dramatically improves OIC’s offering to their investors. Put it another way – if you’re someone who simply hasn’t got the time to wade through piles of paper or emails (perhaps sent at some point in 2017…) from their Fund Manager, it’s nothing short of a God-send. Interested in our work creating new design for financial services? If you’re the Managing Partner or Marketing Director of a financial services business keen to have branding and online presence of this calibre, we’d welcome a discussion on ways we could collaborate. Please give our office a call on 020 7351 4083.